Watch along with us LIVE as we broadcast the Rehearse Quick Draw presentation from the historic Avalon Theatre stage. Tune in at 12:30pm to watch the LIVESTREAM of the Rehearse Quick Draw 7/19 presentation LIVESTREAM. 14th Annual Local Color Art Show & Sale! Our 2018 Local Color Show is dedicated in loving memory of the Working Artist’s devoted and beloved artist/member, the remarkable and talented, Perry Foster. Read more about 14th Annual Local Color Art Show & Sale! You Are Invited to Local Color! The Local Color 2018 Juror has selected 42 talented Eastern Shore artists to participate in this year’s Local Color Art Show & Sale. 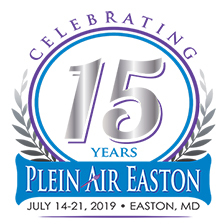 If you are coming to Plein Air Easton this year, you must not miss it! Held in conjunction with Plein Air Easton, this show offers a delightful opportunity to browse and purchase art created exclusively by working artists from around the Eastern Shore. Read more about You Are Invited to Local Color! Free Acrylic, Oil and Watercolor Demonstrations! Buddhist artists in western Afghanistan are credited with creating the first oil paintings sometime between the fifth and tenth centuries, while the roots of watercolor painting are said to extend back to the cave paintings of Paleolithic Europe. Once again, Plein Air Easton welcomes artist Tony Zatzick who will offer fun and informative demonstrations of these two influential art forms in the Avalon Theatre and just added an acrylic demo to the schedule. Read more about Free Acrylic, Oil and Watercolor Demonstrations! Local Color Show Artist List & Caribbean Cruise for Two Raffle! The Local Color Art Show and Competition, sponsored by the Working Artists Forum, will be held Friday, July 15th - Sunday, July 17th, in the Crystal Ballroom of the Tidewater Inn in Easton. Local Color is held in conjunction with Plein Air Easton Art Festival and will feature paintings by artists representing the Delmarva Peninsula. The list of outstanding artists who have been juried into Local Color is below. Read more about Local Color Show Artist List & Caribbean Cruise for Two Raffle!